Background: During various sterilization procedures of NiTi instruments adversely affect their fracture resistance due to surface corrosion or roughness making them vulnerable to cyclic fatigue. Aim: To evaluate the resistance to cyclic fatigue from repeated cleaning and sterilization procedures on corrosion of NiTi rotary files under various concentrations of Sodium Hypochlorite (NaOCl) and autoclave sterilization. 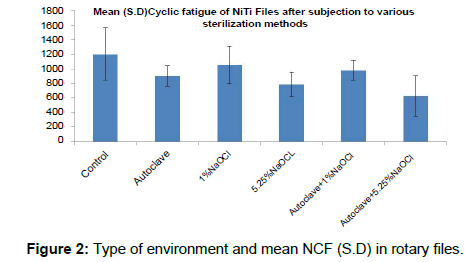 Materials and methods: A total of 60 NiTi files (ProTaper S1) divided into 6 groups (n=10) according to the environment in which the cyclic fatigue test was to be studied were subjected to different methods of sterilization involving autoclaving at 121°C and immersion in 1% NaOCl and 5.25% NaOCl in this study using root canal models (Curved canal, DENTSPLY, USA) simulating a curved root canal. Endodontic rotary files (ProTaper S1) not exceeding 16 mm intracanal length was used under the specified irrigating solutions and repeated till the rotary file fractured. The number of cycles needed for instrument fracture (NCF) was calculated and the NiTi files in each group were further examined under SEM with EDX analysis (S-3500N, Hitachi, USA) for topographical analysis. Results: A statistically significant reduction in the lifetime of the NiTi rotary files was observed with an increase in number of cycles of autoclave sterilization files and increasing concentrations of NaOCl and when used in combination of both autoclave and chemical sterilization. The topographic analysis of the fractured files in all groups exhibited classical signs of fatigue fracture. Conclusion: Clinicians should judiciously use these instruments with respect to repeated and multiple use of instruments that make them vulnerable to cyclic fatigue/fatigue failure rendering these instruments susceptible to fracture within the root canal anatomy leading to otherwise avoidable complications possibly due to cumulative surface corrosion or roughness. The aim of this study was to evaluate the resistance to cyclic fatigue of Ni Ti rotary files by repeated cleaning under various concentrations of Sodium Hypochlorite (NaOCl) and autoclave sterilization procedures. Group 5: 10 files subjected to three cycles of autoclave sterilization followed by immersion thrice in 1% NaOCl plus at 30 second intervals. Group 6: 10 files subjected to three cycles of autoclave sterilization followed by immersion thrice in 5.25% NaOCl at 30 second intervals. Root canal models (Curved canal, DENTSPLY, USA) simulating a curved root canal, patent to a hand file size ISO 15 [Figure 1] was used to allow for standardization enabling direct comparison and visualization. The transparent acrylic root canal models were prepared by hand files initially till size 20 (Stainless Steel K-Files, Henry Schein, USA) to establish the path and patency. Endodontic rotary files (ProTaper S1) not exceeding 16 mm intracanal length was used in a special contraangled hand piece and motor (X-Smart, DENTSPLY, USA) with controlled torque of 16:1 reduction and 300 RPM for 30 seconds under the specified irrigating solutions and repeated till the rotary files got fractured. The rotary files were cleared of debris by ultrasonication in water bath (Small, Henry Schein, USA) for 5 minutes between every use. The number of cycles needed for instrument fracture (NCF) was calculated by multiplying the time recorded in seconds by the number of instrument rotations or cycles per second. The NiTi files in each group were further examined under SEM with EDX analysis (S-3500N, Hitachi, USA) to view for topographical analysis. 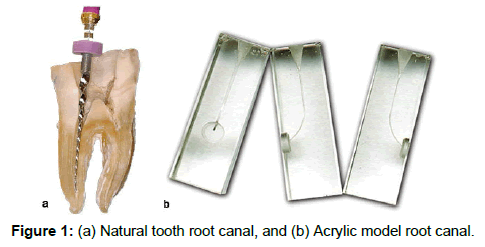 Figure 1: (a) Natural tooth root canal, and (b) Acrylic model root canal. To avoid the observer’s bias, the coding of groups was employed so as to blind the groups to the examiner analyzing the results. The obtained data were analyzed with SPSS software (SPSS version 20.0, SPSS, Chicago, IL, USA) and evaluated with ANOVA. The mean numbers of cycles needed for instrument fracture (NCF) values for different forms of environment are represented in Table 1. Higher NCF values represent greater resistance to cyclic fatigue. Table 1: Type of environment and mean NCF (S.D) in rotary files. The number of cycles to failure (NCF) in group 1 was 1200 ± 360. Autoclave sterilization significantly reduced the NCF of endodontic NiTi files in group 2 (900 ± 140) and in combination with NaOCl in group 5 (976 ± 140) and group 6 (626 ± 280). The number of cycles to failure was more pronounced in group 6. Increasing concentrations of NaOCl had increasingly detrimental effects on the life of the NiTi rotary files. Those treated with the 5.25% solution in group 4 (784 ± 170) and group 6 (626 ± 280) was significantly (p<0.05) lower than their counterparts in group 3 (1050 ± 260) and group 5 (976 ± 140) treated under 1% NaOCl. [Table 1 and Figure 2]. Figure 2: Type of environment and mean NCF (S.D) in rotary files. ProTaper files in group 3 showed a significantly greater resistance to cyclic fatigue than all other groups (p<0.05). [Table 2] A significant (p<0.05) difference in means between all groups was observed, suggesting a presence of cyclic fatigue in rotary files, based on the type of environment they were subjected to. The topographic analysis of the fractured files in all groups exhibited classical signs of fatigue fracture characterized by small cracks on the plane of maximum shear to a characteristic dimpling feature and fatigue striations. [Figure 3] The distribution of the crack initiation spread deeper in the 5.25% NaOCl than 1% NaOCl without autoclave sterilization. [Figures 4 - 7]. No instrument neither experienced intra canal failure during clinical use nor exhibited plastic deformation due to torsional fatigue during prestressing in the curved canals. Figure 3: The fractured surface of rotary NiTi file covered with dimpling characteristics. 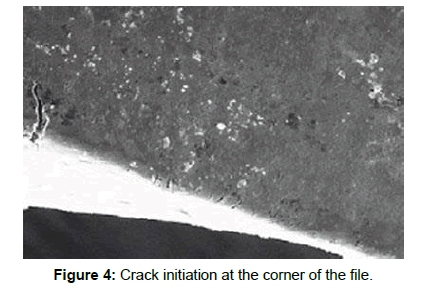 Figure 4: Crack initiation at the corner of the file. 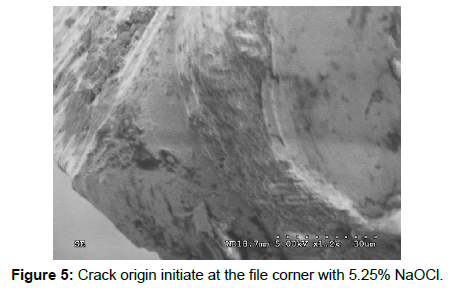 Figure 5: Crack origin initiate at the file corner with 5.25% NaOCl. Figure 6: Surface characteristics of NiTi file S1: (a) No Irrigation, (b) 1% NaOCl, and (c) 5.25% NaOCl. Figure 7: Surface characteristics of NiTi file S1: (d) autoclave, (e) 1% NaOCl and autoclave, (f) 5.25% NaOCl and autoclave. Table 2: ANOVA for difference in means between and within group, cyclic fatigue of rotary files. Ni-Ti endodontic instruments are routinely associated with cyclic fatigue accounting up to 50% to 90% of mechanical failures. In this study, a total of 60 endodontic NiTi rotary files (ProTaper S1) were subjected to different methods of sterilisation using root canal models (Curved canal, DENTSPLY, USA) simulating a curved root canal. The number of cycles needed for instrument fracture (NCF) was calculated for each file followed by examination under SEM with EDX analysis (S-3500N, Hitachi, USA) to view for corrosion. In order to get closer to clinical conditions, our study protocol involved subjecting the NiTi files to both autoclave sterilization and NaOCl irrigation under different concentration and immersion times and instrumentation in simulated root canal models. The properties of NiTi instruments were significantly affected following exposure to autoclave sterilization and NaOCl irrigating solutions in the endodontic environment. Clinicians should judiciously use these instruments with respect to repeated and multiple use of instruments that make them vulnerable to cyclic fatigue/fatigue failure rendering these instruments susceptible to fracture within the root canal anatomy leading to otherwise avoidable complications possibly due to cumulative surface corrosion or roughness. The study is of great clinical significance for day to day practice especially for endodontists as well as general dentists. It reveals the fact that the repeated use and sterilization procedures for NiTi rotary files make them vulnerable to cyclic fatigue; hence should be judiciously used to avoid fractures of the rotary files within the root-canals during endodontic treatment of patients. Schneider SW. A comparison of canal preparations in straight and curved root canals. Oral Surg Oral Med Oral Pathol.1971;32:271. Peters O. Current challenges and concepts in the preparation of root canal systems: A review. J Endod. 2004;30:559. Thompson SH. An overview of nickel-titanium alloys used in dentistry. Int Endod J. 2000;33:297-310. Parashos P, Gordon I, Messer H. Factors influencing defects of rotary nickel-titanium endodontic instruments after clinical use. J Endod. 2004;30:722. Iqbal M, Kohli M, Kim J. A retrospective clinical study of incidence of root canal instrument separation in an endodontics graduate program: A PennEndo database study. J Endod. 2006;32:1048. Anderson ME, John WH, Parashos P. Fracture resistance of electropolished rotary nickel titanium endodontic instruments. J Endod. 2007;33:1212-1216. Berutti E, Angelini E, Rigolone M, Migliaretti G, Pasqualini D. Influence of sodium hypochlorite on fracture properties and corrosion of Protaper rotary instruments. Int Endod J. 2006;39:693-699. Cheung GS, Shen Y, Darvell BW. Effect of environment on low-cycle fatigue of a nickel-titanium instrument. J Endod. 2007;33:1433-1437. Shen Y, Qian W, Abtin H, Gao Y, Haapasalo M. Effect of environment on fatigue failure of controlled memory wire nickel-titanium rotary instruments. J Endod. 2012;38:376-380. 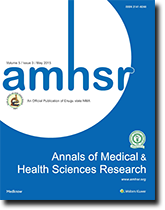 Sundaram KM, Srinivasan N, Ebenezar RA, Narayanan LA, Rajkumar KR, Mahalaxami S. Comparative evaluation of the effects of multiple autoclaving on cyclic fatigue resistance of three different rotary Ni-Ti instruments: An in vitro study. J Conserv Dent. 2013;16:323-326. De Melo MC, Bahia MG, Buono VT. Fatigue resistance of engine driven rotary nickel-titanium endodontic instruments. J Endod. 2002;28:765-769. 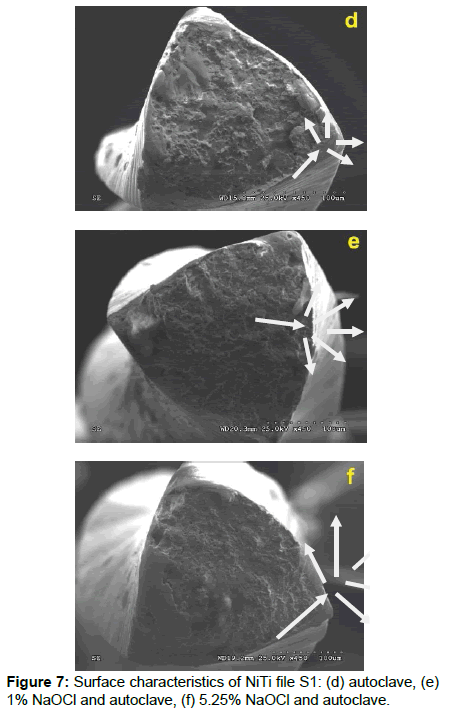 Silvaggio J, Hicks L. Effect of heat sterilization on the torsional properties of rotary nickel-titanium endodontic files. J Endod. 1997;23:731-734. Mize SB, Clement DJ, Pruett JP, Carnes DL. Effect of sterilization on cyclic fatigue of rotary nickel-titanium endodontic instruments. J Endod. 1998;24:843-847. Hilt BR, Cunningham CJ, Shen C, Richards N. Torsional properties of stainless-steel and nickel-titanium files after multiple autoclave sterilizations. J Endod. 2000;26:76-80. Peters OA, Gluskin AK, Weiss RA, Han JT. An in vitro assessment of the physical properties of novel Hyflex nickel-titanium rotary instruments. Int endod J. 2012;45:1027-1034. Shabalovskaya S, Anderegg JW. Surface spectroscopic characterization of TiNi nearly equiatomic shape memory alloys for implants. J Vas Sci Technol A. 1995;13:2624-2632. Alexandrou GB, Chrissafis K, Vasiliadis LP, Pavlidou E, Polychroniadis EK. SEM observations and differential scanning calorimetric studies of new and sterilized nickel-titanium rotary endodontic instruments. J Endod. 2006;32:675-679. Schafer E. Effect of sterilization on the cutting efficiency of PVD-coated nickel-titanium endodonticinstruments. Int Endod J. 2002;35:867-872. Rapisarda E, Bonaccorso A, Tripi TR, Condorelli GG. 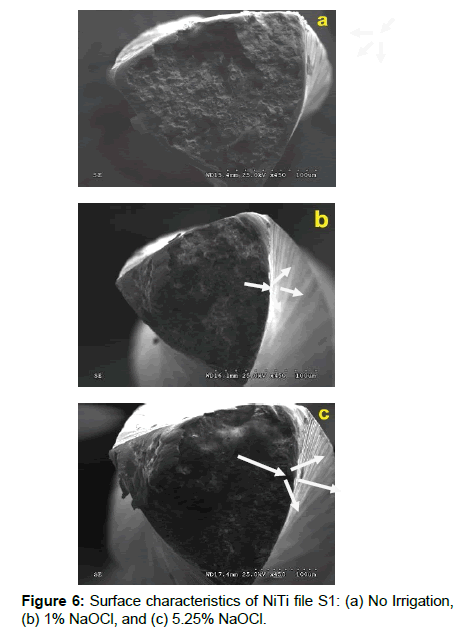 Effect of sterilization on the cutting efficiency of rotary nickel-titanium endodontic files. Oral Surg Oral Med Oral Pathol Oral Radiol Endod. 1999;88:343-347. Abuhaimed TS. Effect of environment on cyclic fatigue of ProTaper Next rotary files. Saudi Endod J. 2018;8:117-122. Champa C, Divya V, Srirekha A, Karale R, Shetty A, Sadashiva P. An analysis of cyclic fatigue resistance of reciprocating instruments in different canal curvatures after immersion in sodium hypochlorite and autoclaving: An in vitro study. J Conserv Dent. 2017;20:194-198. Peters OA, Roehlike JO, Baumann MA. Effect of immersion in sodium hypochlorite on torque and fatigue resistance of nickel-titanium instruments. J Endod. 2007;33:589-593. Darabara M, Bourithis L, Zinelis S, Papadimitriou GD. Susceptibility to localized corrosion of stainless steel and NiTi endodontic instruments in irrigating solutions. Int Endod J. 2004;37:705-710. OâHoy P, Messer H, Palamara J. 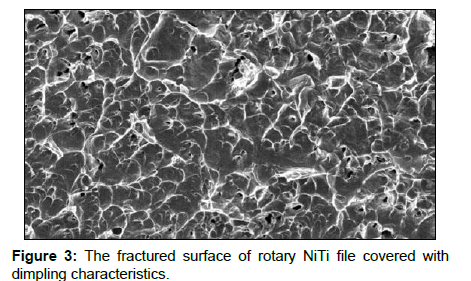 The effect of cleaning procedures on fracture properties and corrosion of NiTi files. Int Endod J. 2003;36:724-732. Busslinger A, Sener B, Barbakow F. Effects of sodium hypochlorite on nickel-titanium Light speed (R) instruments. Int Endod J. 1998;31:290-294. Haikel Y, Serfaty R, Wilson P, Speisser JM, Allemann C. Mechanical properties of nickel-titanium endodontic instruments and the effect of sodium hypochlorite treatment. J Endod. 1998;24:731-735. Demiral M, Keskin C, Inan U. Effect of sodium hypochlorite activated by heating on the cyclic fatigue resistance of one-shape rotary instruments. J Dent App. 2017;4:372-375. Stokes OW, Fiore PM, Barss JT, Koerber A, Gilbert JL, Lautenschlager EP. Corrosion in stainless-steel and nickel-titanium files. J Endod. 1999;25:17-20. Clarkson RM, Moule AJ. Sodium hypochlorite and its use as an endodontic irrigant. Aust Dent J. 1998;43:250-256. Yared GM, Bou Dagher FE, Machtou P. Cyclic fatigue of profile rotary instruments after simulated clinical use. Int Endod J. 1999;32:115-119. Cheung GS, Darvell BW. Fatigue testing of a NiTi rotary instrument. Part 1: Strain-life relationship. Int Endod J. 2007;40:612-618. Cheung GS, Darvell BW. Fatigue testing of a NiTi rotary instrument. Part 2: Fractographic analysis. Int Endod J. 2007;40:619-625. Parashos P, Messer HH. Rotary NiTi instrument fracture and its consequences. J Endod. 2006;32:1031-1043.